Students sketch their self portraits in one mirror and then write adjectives used to describe themselves in the other. 1. This is a great practice activity when descriptive adjectives are introduced. 2. Use as a back to school review of descriptive adjectives. 3. This is a fun speaking activity when students present their completed sketches to their classmates. 4. Use at the beginning of the year and the end of the year to see how students progress throughout the year. 5. Decorate the hall or a bulletin with these colorful, personalized student creations. 1. Black and white mirrors, small mirror with 10 numbered spaces for adjectives, large mirror for self-portrait. 2. Colored mirrors, small mirror with 10 numbered spaces for adjectives, large mirror for self-portrait. 3. 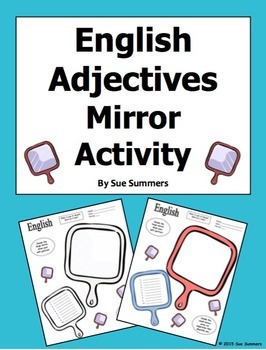 Black and white mirrors, large mirror with 10 numbered spaces for adjectives, small mirror for self-portrait. 4. Black and white mirrors, small mirror for self-portrait, large mirror with 5 numbered spaces for adjectives. Instructions are included on the activity. Please click here to see more of my English Language Arts resources. 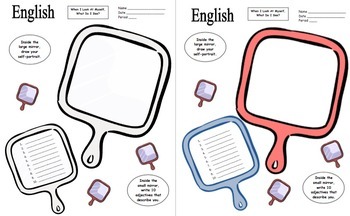 Please click here to see my English emergent reader resources.